The Super Avenger is one of the most beloved watches from the Swiss manufacturer Breitling. With an impressive 48-mm diameter and 18-mm thickness, it catches the eye. The movement is also COSC-certified, ensuring it runs incredibly precisely. Since its introduction in 2004, Breitling fans all over the world have been enthralled with the Super Avenger. The watch's distinctive design embodies strength and sturdiness, one reason it's developed into one of Breitling's most beloved watch models. With a case diameter of 48 mm and a thickness of around 18 mm , it immediately jumps into view. It's significantly larger than the normal Avenger, which is less than 17 mm thick and "only" has a 43-mm diameter. Wristwatches were much smaller just a few centuries ago; the standard size for a men's watch used to be 35 mm. Famous wearers of the Super Avenger have helped the watch achieve its status. American rapper and actor Ludacris as well as Olympic swimmer Ryan Lochte wear a Super Avenger, as does tattoo artist Ami James, known for her role on the reality show Miami Ink. Are you looking for a large wristwatch that attracts attention? 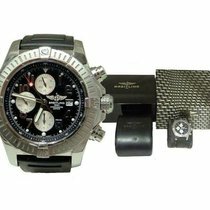 Then the Breitling Super Avenger is perfect for you. With a case diameter of 48 mm, it automatically catches the eye. Its distinctive, functional design emphasizes its imposing look. A pre-owned Super Avenger is available for around 2,400 euros . New models are available starting at 3,300 euros. The Super Avenger's successor, the Super Avenger II, can be found pre-owned for around 3,000 euros, while new, it costs around 3,500 euros. The design of the Super Avenger is defined by its functionality. The presence of four bezel rider tabs, which resemble small grips, is one of its most noticeable features. They're located at three, six, nine, and twelve o'clock. The tabs offer such a good grip that it's easy to rotate the bezel even with gloves on. Watches from the Chronomat, Colt, and Aerospace collections also have rider tabs on their bezels. The crown and push-pieces on the Super Avenger feature a relief which makes them easier to turn as well. The double gasket crown is screw-down, as are the push-pieces. Thanks to the screw-down case back, the watch is waterproof to 300 m (30 bar). With the help of the engravings on the case back, you can quickly and easily convert units of measurement. 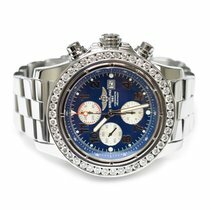 Breitling mainly uses stainless steel for the cases. You can also find older Super Avenger models made of titanium. Titanium is more lightweight than stainless steel, yet just as hard. Alternatively, you can buy a Super Avenger II with a diamond-set bezel. The dial is available in black, blue, and silver. The black dial features either light or black subdials. The 30-minute counter is located at twelve o'clock, the small seconds at nine o'clock, and the 12-hour counter at six o'clock. The date display window is at the three o'clock position. Older models were also available with a white dial, which created the illusion that the watch was larger. Domed sapphire glass with anti-reflective coating on both sides protects the dial. Breitling offers various band materials and colors. The leather straps are available in black, blue, green, or light or dark brown. The sturdier textile varieties come in black or khaki green, and the rubber strap is available in black, bronze, and blue. A three-link stainless steel bracelet is also available. 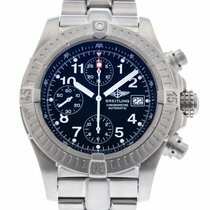 Breitling introduced the Super Avenger II in 2013. It's a bit smaller than its predecessor, but only by a tiny bit: The original Super Avenger was 48.4 mm in diameter, and the Super Avenger II is exactly 48 mm in diameter. It also got a little thinner: from 18.6 mm to 17.75 mm. This makes the Super Avenger II a thin, yet still powerful and imposing watch. However, if you want an even bigger watch, Breitling has you covered with the Avenger Hurricane. 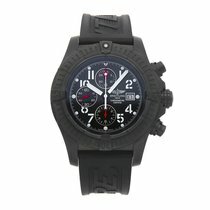 The 50-mm matte black chronograph is made of Breitlight, a new lightweight material. The in-house caliber B12 powers the watch. The Hurricane has a 24-hour display, meaning the hour hand makes one full rotation every 24 hours. The hour hand on more common 12-hour watches makes two full rotations per day. Like the Super Avenger caliber, the B12 is also COSC-certified. Breitling's caliber B13 powers the Super Avenger. The chronograph movement is based on the Valjoux 7750. This classic ETA caliber is one of the most successful automatic chronograph movements. Countless notable manufacturers use this caliber in their watches such as TAG Heuer with the Carrera and Tudor with the Fastrider. The caliber has a 42-hour power reserve and vibrates at a frequency of 28,800 alternations per hour (A/h). This enables the watch to time to 1/8th of a second. Using the B13, you can time periods up to 12 hours. Like every modern Breitling caliber, the B13 is also COSC-certified. This confirms that the movement deviates no more than +6 seconds and -4 seconds per day.